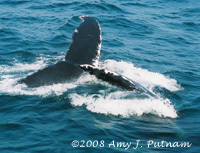 If only I lived closer to the coast (I’m on the NH/VT border), then I would get out on even more whale watches! I do pretty well, all told. the trip with the Aquarium was so good for the whales, I didn’t waste any time getting back out. This time it was out of Gloucester on Capt. Bill and Sons. Hadn’t made it out this way since the Earth Day whale watch in May. We had a spectacular day on the water with loads of great sightings. Mothers and calves were in seeming abundance. Apostrophe and her calf were out and about and “bumped into” Bilbo/Spoon with her calf. Apostrophe’s calf seemed to want to play with the other but there was no mutual interest. I know it’s easy to anthropomorphize these animals, but it was easy to compare the activity to what one might see on any playground with kids who are willing and kids who hide behind their mom’s leg. Apostrophe pulled away and took her calf along, thus ending the “playground encounter”. Not much later we found Tornado and her calf. They wound up joining another association of 3 adults: Nile, Sundog and Tunguska. There was not a lot of overly demonstrative surface activity but we did get some nice looks at the various flukes in the group. Another terrific day on the water! The total was 14-16 humpbacks (also seen and ID’d by dorsal was possibly Fern) and half a dozen minkes moving about the area. So what do I do after complaining about the crowded boats in Provincetown? I take a trip from Boston with the New England Aquarium. What can I say? I’m a member and I try to go out on their whale watches each year. I’m not crazy about the 3 level catamaran’s capacity for hundreds, but there I was. One of the things that makes me nutty about these cruises is that people tend to be sort of oblivious about things like their trash blowing overboard. And I don’t think enough is said by the naturalists to make sure people know about the problem. But, I’m not the one with the microphone (just a wee blog). We did have a gorgeous day on the water, and a terrific whale watch overall. Our first treat was a display of lobtailing. I could easily identify one of the two visible whales as Alphorn. When I got home to look at photos and compare them to the thumbnails provided by PCCS, I saw that the other one was Hancock. Because there was so much interest in this display by other boats and we could see more spouts elsewhere, we moved on. Next up we found two adults and a calf. One of the adults was Banyan, who is easy to ID even without seeing flukes because of the around of scarring around the tail stock from an entanglement. We also found a juvenile whale who was breaching, though I was not quick enough with the camera to catch it. Some flipper slapping was also seen, making this trip a great array of surface behaviors. There’s actually a very simple yet critical way to save the whales. The Provincetown Center for Coastal Studies is the only east coast U.S. organization that is federally permitted to disentangle whales from fishing gear. Yet next year, their funding will be so drastically cut as to jeopardize the whole program. Congress’ inability to get a budget passed is at the root of this, though the belief is that funding will be included in a final budget. Meanwhile, PCCS continues to go out and disentangle whales on a scarily frequent basis, reinforcing just how critical this program is. A recent disentanglement press release talks about this loss of funding. There is also a story on boston.com about this topic. Donate to PCCS and help keep the disentanglement team able to keep saving whales. It’s easy, it’s tangible, and it’s critically necessary.